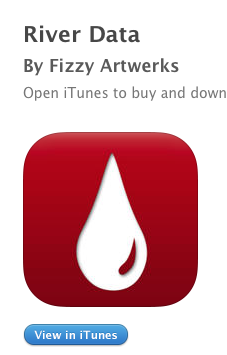 River Data by Fizzy Artwerks is probably one of my most used Apps on my phone. I run an Apple 6+, and I log in each morning on my way to the river to see if there are any changes that I need to know about. As an avid steelhead angler I know that water level and temperature are two key components that I need to follow to have the most success on the river. 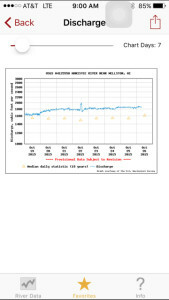 River Data allows be to connect easily and quickly to all the USGS sites that I need to follow. Listed on your favorites home screen I can connect to any USGS that I have tagged as a favorite. 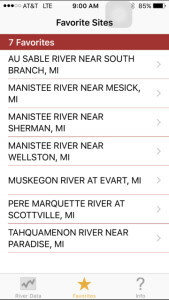 As you can see I follow a few different sites on the Manistee River. 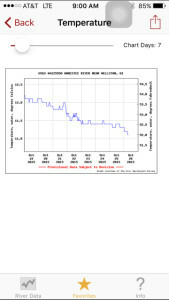 I look for temperature differences and if water volume is increase or decreasing upstream. Having these river sites tagged as favorites makes for easy navigation , and my personal favorites are a quick click away. River Data lists your favorite sites alphabetically to make the search even quicker for you. All you have to do is tap the star icon on a USGS site and it’s added to your favorite list. River Data is the ultimate river monitoring app for the US. Trusted by fisherman, kayakers, scientists, and other river enthusiasts that need the fastest available information from USGS water monitoring sites.